Brickmania is a part of the international LEGO fan community and we participate in as many events as our schedule allow. Following the list of scheduled Brickmania appearance for 2012 so far. This is a constantly evolving list so check back often! Brickmania will have a full selection of products for sale at all of these events. We open our warehouse doors to for a public open house on the second Saturday of each month. On display are massive Lego train layouts by the GMLTC and TCLTC, dioramas featuring Brickmania models, and regularly rotating guest builders. We also have a play area for the kids, and a small store featuring hard-to-find Lego rarities and select after-market vendors (BrickArms, Brickmania, etc.). Admission to the fun is free. The first of a king LEGO fan event in Alabama and we will be present with a full Brickmania / Brickarms retail booth! Brickmania will again participate in the now second annual Bricks by the Bay Lego fan convention, now moved to a bigger venue in Santa Clara, CA. They only have one day set aside the general public, so we recommend getting registering for the full convention if you want to be guaranteed admission. 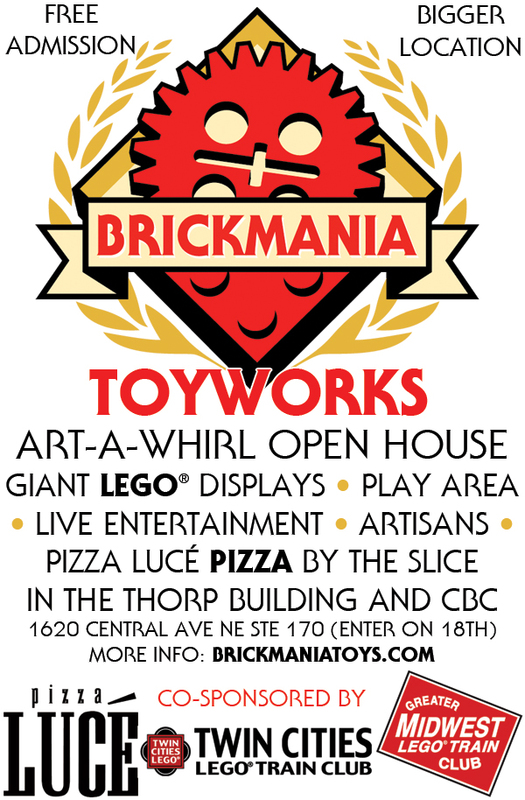 The Brickmania Toyworks will be open once again during Art-A-Whirl 2012. We will be located in our bigger new space (150 feet down the hall) and will be hosting booths from local artisans, live entertainment and pizza but the slice available from Pizza Luce. More than 500 artists participate in the NE Minneapolis Art-A-Whirl, making it the largest art crawl in the world. Bricks Cascade public exhibition will be held in Portland Oregon on Saturday, June 2nd and Sunday, June 3rd. Please join us at the Oregon Convention Center during these dates to view thousands of artistic and ingenious marvels created by Adult LEGO enthusiasts and very talented young builders from around the world. Vendors will also be available for purchase of T-shirts, LEGO Minifigs, Custom made plastic elements and old/vintage LEGO sets. Public EXPOTickets can only be purchased on site at the Oregon Convention Center on the above dates. 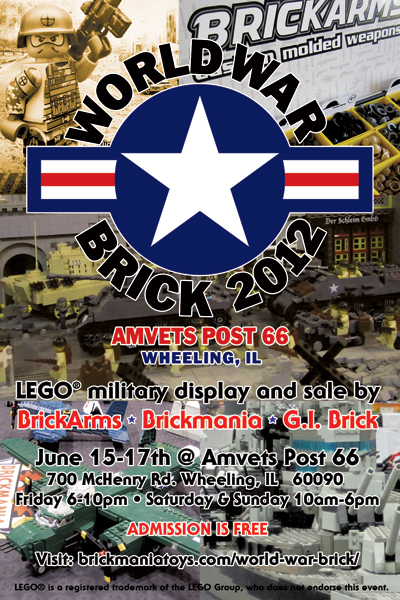 A massive military Lego display taking place off-site during Brickworld 2012 at the Amvets Post66 in Wheeling, IL. BrickArms founder Will Chapmen will be present and have an exclusive item for sale, plus there will be a massive assortment of products for sale from Brickmania, BrickArms and GI Brick. Admission to World War Brick 2012 is free, but we will be collecting donations for Veterans organizations. Brick Fiesta 2012 will be held at the Westin Galleria Hotel in Houston, Texas. The hotel is situated in the Galleria mall and is only a two or three minute walk from the Houston LEGO Store! Second annual Canadian Lego fan event, taking place at the Airport Hilton, Toronto. 10,000 sf of amazing Lego displays built by hobbyists from across Canada and the USA. You can also let your child build in the “Look What I Made” are, visit vendors for unique Lego and Lego-related merchandise, speak with the builders of these amazing creations, and so much more. Brickfair is a massive LEGO fan event that takes place annually in the Washington DC area. To avoid the crush around the Brickmania & BrickArms booth, we now have eight(!) tables reserved for the our biggest convention booth ever! Public days are August 4th and 5th, but we STRONGLY encourage serious attendees to register for the private convention (starts 2 days earlier) and beat the crowds. Seriously. Our friends at Atlas Obscura are planning to hosting Field Trip Day in six different US cities on September 29th to highlight all of the local cool and out of the way places. For Minneapolis they are featuring a bike tour around Northeast Minneapolis and have nominated us to be one of the featured stops. Since we’ll all be here we may as well invite the general public as well. Note this open house will be held from noon to 6pm (two hours later than our usual open house hours). If you’d like to participate in the entire Field Trip Day tour, please go to the official web site and get yourself signed up. The event is free but space is limited for some of the stops! We’re having our special haunted warehouse event again this year. Watch the blog for more information! We will be returning to Memphis for the third annual Comic and Fantasy Convention. This weekend festival includes numerous events, guests, exhibitions and public performances, covering the entire gamut of Comic, Sci-Fi and Fantasy genres, including a mini Lego fan convention. This year’s event will be taking place at the Memphis Hilton. Join us at the Northern Illinois Lego Train Club’s annual holiday display at beautiful Cantigny Park in Wheaton, IL. We’ll have stuff for sale as well as a diorama featuring tons of Brickmania models. Admission is free but there’s a small fee for parking. Be sure to include time to check out the First Infantry Divisions’ museum and tank collection while you’re there!